Imagine an uninhabited cove lined with pine trees instead of coconut trees. Imagine more…got the picture? Now put fine sand and clear water on the shore, and on both ends of the cove, hills that change color according to the time of day! Then try imagining the uninterrupted humming of the waves as they touch the shore. Relaxing isn’t it?! How about adding a cool bunch of mountaineers?! Voila! You’ve got the Anawangin of 2007! You want the present day picture of Anawangin? 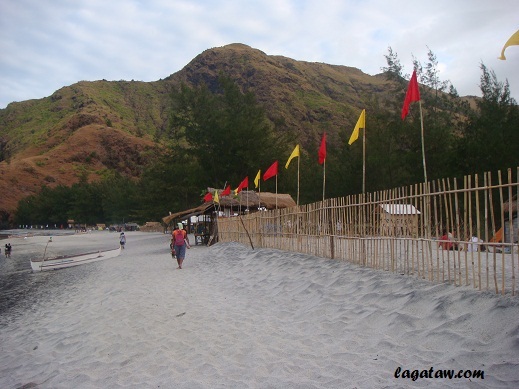 OK, add a hundred or more huts on the shore fronted by five local stores that resemble the shanties of Payatas. Then divide the whole length of the cove into four properties each with their own incongruous design of picket fences (and banners might I add). Then add a bunch of Derek Ramsey wannabes playing Frisbee and all those urbaneers with their moms and dads and children…all from planet look-at-me-look-at-me! No, that’s not Puerto Galera! That’s still Anawangin! I know this may sound unbelievably selfish on my part but it’s really good when you see a place before it gets invaded by urbaneers. You see nature at its best! You get the perfect time to relax and de-stress! Once urbaneers flock the place, it becomes a grotesque mix of the city and Mother Nature! Yes Anawangin is no longer the beauty that we once adored. But it should not be considered as something totally bad. The division of the cove into four properties spurred competition among caretakers and with competition, the customers are served better. If you really wanna know the truth, I kind of enjoyed it more than I did Nagsasa Cove in 2010. The prices of goods and services there are now fixed. Four years ago, it was difficult for visitors to estimate what Mang Manuel (the caretaker) meant by donation. Some would give P1000 which makes Mang Manuel frown at P500. There are more things you can buy there now… and more bathrooms. In other words, Anawangin has become more convenient. 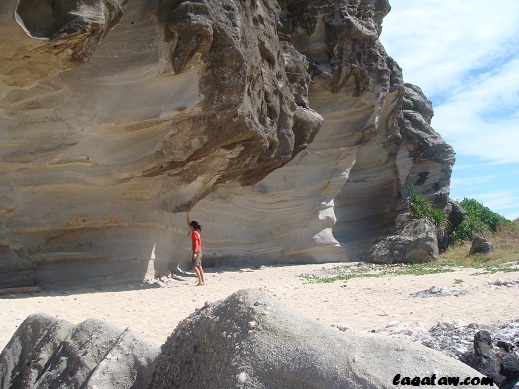 So if you’re going for an adventure-flavored convenient getaway this summer, head for Anawangin. The following information may be of help to you! To get there, you have to traverse the North Luzon Expressway (NLEX) and exit at San Fernando, Pampanga (60kms. from the Metro Manila (Balintawak) exit of the NLEX). San Fernando is one of Pampanga's bigger business hubs so expect some traffic. From San Fernando, cross a "flyover" bridge to connect you to the highway going towards Lubao, Pampanga (Gloria Arroyo's hometown). Drive this road straight for around 30 kms. more and you will reach the Layak junction in Bataan where you will take a right towards Dinalupihan. Follow the route towards Olongapo (left) when you reach the fork indicating "To Olongapo" and "To Dinalupihan proper". This is where the mountains of Bataan begin and it is not unusual to find some people hawking animals (i.e., pythons, monitor lizards, crabs, hawks, civets, etc.) from the forest, either as a companion or your next meal! Illegal, yes, run-of-the-mill, no. A short drive further, you will take a left to get to the Tipo junction that will serve as the "shortcut" entrance of Subic Bay Management Authority (SBMA). warning... YOU MESS UP THE PLACE, I KILL YOU, Y'HEAR!!! 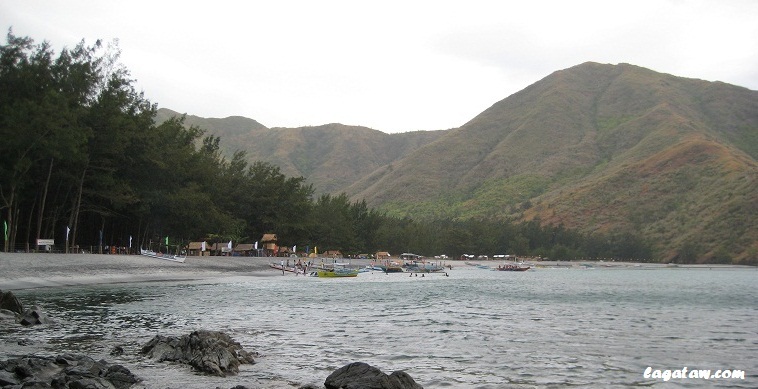 Victory Liner has daily trips to Iba, Zambales. The first trip is at 0530hrs and the last is at 2330hrs. Take the bus (Victory Liner) bound for Manila. yikes at bakit meron ng bakod at flags..
minsan may mga hikers/mga turista/etc na ang punto eh pumunta lang talaga, di natin pwede pigilan, sa isang banda at kung susuriin nang mabuti, malaki ang impluwensya nang makabagong telekomunikasyong "internet" sa kapaligiran. ang mabilis at simpleng impormasyon nang isang lugar ay madaling malaman, sa isang "click" lang ay kaboommm kuha na agad. Hindi ba't nung makalumang taon (1990's) ay pawang sa sulat lang ang ating komunikasyon? at dahil dito ay napakatagal at bihira malaman ang isang impormasyon? yan ang isang epekto nang makabagong telekomunikasyon. mag isip isip tayo mga human beings.